The concrete road at the heart of the controversy in Baħar iċ-Ċagħaq. A Planning Authority decision to withdraw an enforcement notice issued years ago following the unauthorised opening of a road in Baħar iċ-Ċagħaq has left residents fuming and raised eyebrows. The controversy revolves around what was previously a 100-metre walkway on garigue land linking Triq Qalet Marku to a country road leading to Magħtab. In 2010, unauthorised works had been carried out to convert this passageway into a road, by laying fresh concrete on virgin land. Such development had prompted the Planning Authority to issue an enforcement notice on the grounds that inert material had been dumped and a country lane covered in concrete without a permit. However, the PA has recently withdrawn this notice, leaving irked residents fuming. The latter had long been complaining that this quiet area had turned into a busy thoroughfare following the opening of the road. 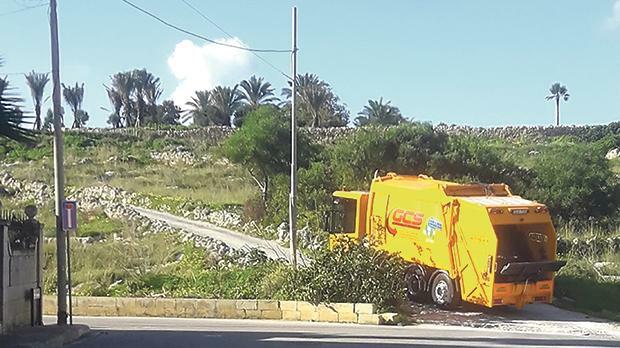 “Apart from having been widened to allow trucks to pass through it, the road has attracted traffic as it is the shortest way to access the Coast Road from areas around Mosta, Naxxar and Għargħur,” was a common complaint levelled by residents who spoke to the Times of Malta. In turn, this led to speed-ing offences in a residential area, pollution and late-night disturbances, they added. Action had also been taken by the Naxxar council, which had blocked the road with bollards and concrete blocks. Yet, such measure proved insufficient as these obstacles were removed after some time. Asked for an explanation over its change in position, a Planning Authority spokesman said that the enforcement notice was withdrawn on the grounds that this road had already been “established” in 1968. He added that no permit was required as the area in question had “only been improved and maintained” thereby not requiring permission, in line with a 2016 legal notice. The latter states that no permit is needed in case of widening, improvement or maintenance of existing roads. Moreover, the authority distanced itself with the decision of allowing cars and heavy vehicles going through this road, saying use or otherwise of the road was regulated by Transport Malta and the council. However, Naxxar mayor Annmarie Muscat Fenech Adami told this newspaper that the council had objected to this decision but, at the same time, admitted it had been left no option. She said that traffic access to the road was opened on the instructions of Transport Malta. Meanwhile, the timing of the decision to withdraw the enforcement notice, which happened very recently, and the justification behind it raised eyebrows. Baħar iċ-Ċagħaq resident Charlot Sultana, insisted that contrary to the authority’s reply, this was not a case of a road being widened. “I have been living here for many years and prior to these illegal works, this was not a road but a lane wide enough for a person to go through,” he said. Satellite images from both the Planning Authority server and Google Earth, indicate this was indeed a footpath and not a road open to traffic. Mr Sultana also claimed that the enforcement notice was withdrawn soon after he had personally flagged the matter to Transport Minister Ian Borg and Environment Minister José Herrera through an e-mail. An aggrieved Mr Sultana expressed concern that such a decision could set a precedent for every country lane to be covered in concrete and turned into a road. “Such decision does not bode well for the environment,” he said.